Movie and India is something, like coffee and cigarettes, which is highly associated with each other. The society is of course affecting Cinema and Cinema is leaving its footprints on society; probably there is no other country in the world, where this interdependency can be observed so clearly as in India. The enthusiasm for movies on the subcontinent is endless. In certain aspects Indian cinema even got religious characteristics, when the acters and actress` are idolized like gods and goddess and movie-theaters are worshiped like temples. Next to the industrial filmproduction in Bollywood, there is of course also a Independent Film scene in India (Indian New Wave), represented by Imtiaz Ali, Smita Patil or Naseeruddin Shah, which you could expect to see on International Film Festivals such as the 63. Berlinale. 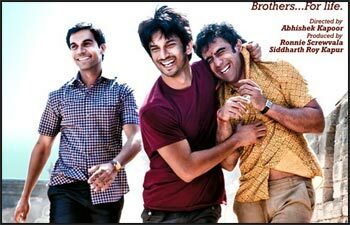 Story: Based on a novel from Chetan Bhagat, three friends (brothers) named Ishaan, Govind and Omkar, with noticeable distinctive characters – one is sportive handsome, the other smart and serious and last one sensitive from good family – try to settle down their own business. Cricket it is – what a surprise – which they are selling full equipment for training and supply, to proof their parents/friends, that they are ready for life. First within a vintage shop in the temple-area, later in a yet to built new shopping mall; when the problems are just about to rise. First a huge earthquake destroys the mall together with all their materialistic-dreams, later the tensions between Muslim and Hindu community is getting worse and the friendship is failing in the middle of this riots. In the end, Ishaan even gets shot in a dramatic revenge by Omkar. Comment: Although ´Kai Po Che` could be evaluated as a quality Bollywood movie, it remains to be an industrial product for the modest masses: Fancy ﬁgures, glamour and shining pictures showing a superconstructed story and overall a pathetic moral: The brave, the patience and the future is winning; cause in the end, smart and serious Govind is having a luxurious sports-ofﬁce in the groundﬂor of a supermodern crickett-stadium, accompanied by wife and son – everything is good. And also the already mentioned generation and value switch, within the fast changing world, could be interpreted as progressive message of the film: Don`t make politics, play cricket… The new generation/new values are pragmatic and future oriented, while the old men are sticking on their pride and honour and dying with it. 2. Forum Expanded Living Archive: Kya Hua Is Shahar Ko? What happened to this City? Another ﬁlm, which is focussing on the ﬁghtings between Hindus and Muslims. This time with a pure documentary, which must be mentioned as true and valuable document of history. Cause the movie was shot in 1984 already, and had it`s second premiere on this years Berlinale, since it was digitalized just a few days before. The path of collecting the film reels in Bombay archieves and elsewhere around the world, must have been a story itself. 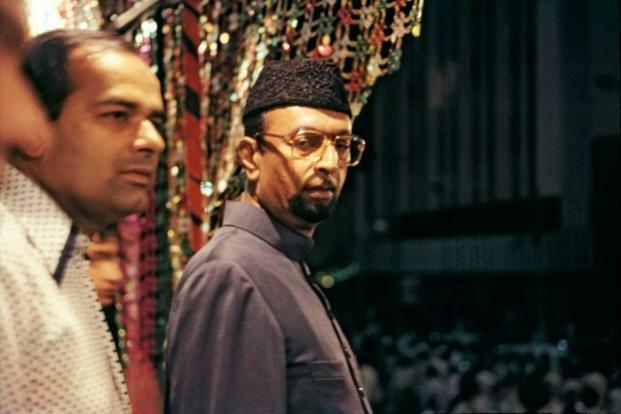 Story: ´Kya Hua Is Shahar Ko?` is a documentary about the genesis and escalation of the Hindu/Muslim conﬂict in Hyderabad in the early 90ies. It focusses the rise of fundamentalist tendencies and ongoing decline of the city, caused by massive terror, fear and destruction. Both from Muslim and Hindu side, as victim and as perpetrators. Switching many times from massive street scenes, containing a lot of movement, to slowly interviews with single peoples, the ﬁlm creates a very deep and touching gravity for the happenings in that part of Indian history. A history, which is still present today, as the antipakistan/antimuslim discussion after the terror attacs in Bombay 2002/2003/2008/2011 prove als well as Gujarati pogroms in 2002, Bombay 1992/1993 and the destruction of the Babri-Mosque in Ayodhya. Hyderabad, a former major Muslim kingdom, can be seen as birthplace for the radical Hindutva movement. Hindutva – Hindu nationalism – is seeking to hide the complexity of modernity behind it`s simple and reactionary Unity-Ideology. A simplification which ´Kya Hua Is Shahar Ko` isn`t giving a single minute on screen. Comment: Very touching, brave and encouraging pictures are showing India 30 years back, with all the challenge within narcissistic politicians, intransparent oeconomics, intolerant clans, idealised history and reproduced ressentiments. Despite that mess, the documentary remains balanced and doesn`t take side, neither Muslim nor Hindu. Additional historical authenticy follows out of the raw cutting – probably a consequense of low budget and technique challenges of the ﬁlm from 1986 – which defenitly strenghens its pureness. For director Deepa Dhanraj, who was only a 27 year young female ﬁlm student at this time, it must have been quite a dangerous situation to produce this ﬁlm, as she confessed in the very informative Q&A session after the screening. She also said, that the ﬁlm was made out of paedagogic intentions, to show the respectively other community the pain and misery of the other group. This public screenings must have been a blast – ﬁlming at it`s best and a blueprint for every documentary-ﬁlmstudent. Story: There are Islands in the Ganges, called Char, between India and Bangladesh; so it is literally no man`s land. Also because these Islands, which are home to a few thousand people, use to appear and disappear frequently due to river dam projects and heavy monsun/cyclone happenings. Life over there is an additional struggle, compared with regular ´mainland` India or Bangladesh: No papers, no property, no power. Over all, the only way to make a living is to smuggle rice or liquor. The camera of Sourav Sarangi follows the challenging life of a boy called Rubel and his family through ups and downs, through days and nights; always searching for the next Rupiee to survive, always hiding from boarder patrol. Comment: Astonashing material is converted here and the director seemed to spend a lot of time into that project. You can see scenes even from a few years time difference. Using different camera techniques (night and day shooting), the ﬁlm sometimes appears a little disrupted. So does the cutting, which seems to keep the material raw, at some parts. Nevertheless, the movement of the river and the directly connected faith of the people with that, is very very impressive. Story: The energy-infrastructure isn`t growing as fast as the Indian demands in 21. century. This fact is leading into a vicious-circle: Consumers aren`t paying their electricity-bills, cause power isn`t provided constantly, and energy-suppliers can`t renew the infrastructure, since there isn`t enough capital to invest, which is causing power-cuts again. Especially cities with high industrial sectors, such as Kanpur (Uttar Pradesh - North India) are affected. Kanpur, the former "Manchester of the East", gets peaks of 15-hour-power-cuts per day. Leading to lifes, which are higly improvised and the acquisition of energy, which is of course illegal. And as the local provider tries to stop endemic power theft, the citizens vent their rage at the proﬁt-governed system. ´Powerless` locates itself in the middle of that clash of interests. The naration is represented by Mrs. Ritu Maheshwari, director of Kesco (local energy supplier) and her opponent, Mr. Loha Singh, energy-Robin-Hood-thief of the streets: The poor and tricky against law and order. Comment: "kya bhat hai!" What a movie – That`s what you wanna see on the screen... A mixture out of very good research and fascinating story: informative, entertaining, shocking, controversial. Both, Loha and Ritu, very symphatic and strong characters, keep the judgment of the audience very balanced in that complex problem. On top, you get that very special sense of Indian humor, which raises a smile even in the darkest darkness of powerless desperation. From my point of view, ´Powerless` is by far the best contribution to the 63. Berlinale from India; maybe even the best movie I have seen this year – everybody who gets the chance, should watch it too!